In the modern world many companies are using Multi-media for their business development. 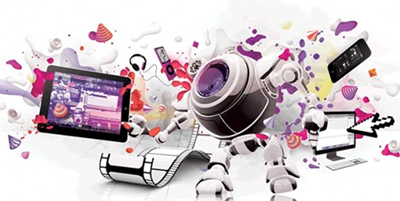 The multimedia files like Video, Images and flash will help the websites to boost their visual aspect. Using multimedia, the websites becomes very eye-catchy and attractive for the end user and this is the reason now a day’s many people started using multimedia on their website, which delivers a good search result for the websites. We all know that quality content helps in better SEO ranking and result in SERP, but also multimedia helps users to engage on website and spend their valuable time on pages they were attracted to. This grabs the user attention and it may be pictures, videos, info-graphics, animations, presentations, VFX, White board animation etc. Adobe Illustrator is a professional quality graphic art program. Although the program is complex and requires some amount of time to become truly master to use this tool. You definitely need to know the use of tools on the tool bar, there are many tools available on the adobe illustrator tool bar. It is a tool used to draw illustrations, cartoons, diagrams, charts and logos. Adobe Photoshop is a graphics editor developed and published by Adobe Systems, The Photoshop is a computer application software used to edit and manipulate digital images. Probably it is the most useful and essential tool for multimedia and online work. This can be used for everything from editing photos to creating web graphics and interactives. Adobe After Effects has a huge user base in motion graphics, digital visual effects and animation sectors used for film making & post-production. We can use plugins on Aftereffect, as there are huge number of third party plugins available for Adobe After Effects. There is a possibility of rendering 3D effects with or without the third party plugins. Aftereffect latest Stable release CC 2015.2 (13.7.2) / May 19, 2016. Multimedia plays important role in online and offline business development, it provides various way to promote your business in the form of image, info-graphics, rich Internet application and animated videos. This all can be done with the help of multimedia tools mention above. We Digital atrium have the well trained professionals to handle this tools. Contact us for innovative and outstanding Multimedia solutions to your business.